Midnight in Umbria’s city of Norcia. Huge construction lights illuminate the facade of the Basilica of St. Benedict. Behind the facade, ruin. The loss of this religious and artistic treasure will take decades to restore-if it can ever be restored. The basilica was constructed over the site where, in 480 AD, the founder of the Benedictine order and Sister St. Scolastica were born. Benedict’s legacy has been plagued with difficulties. The Monastery of Monte Cassino, located close to Rome, was destroyed during the final years of WWII. Though it was rebuilt, the crosses that mark the cost of allied victory dot the cemeteries at the abbey. Now, the loss of the home church. 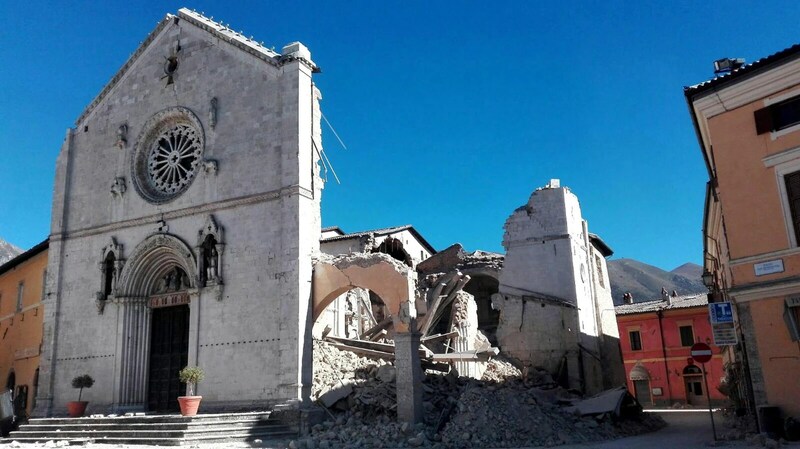 PLEASE keep the people of central Italy in your thoughts, meditations and prayers. 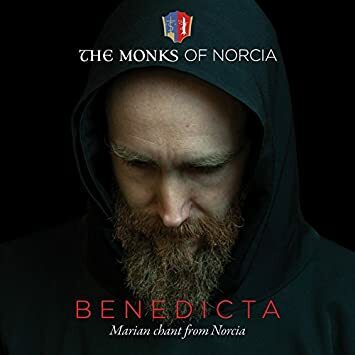 In June of 2015, the monks released a CD of their chants, recorded within the nave of the Basilica. As you hear the bells, calling the monks to service, and you hear the echo of their voices as they reflect off of 13th century wall, please remember that the walls exist no more. Now, the ghostly rise of their voices seek the stars . . .
Fra Carnevale – Who Was This Reclusive Renaissance Painter? It was during a recent visit to the Alte Pinakothek in Munich that I encountered The Annunciation by an artist whose name I did not recognize: Fra Carnevale. My curiosity was roused and I began to research this little known, reclusive, Renaissance artist. Between the years 1420 and 1425, records are scarce; a child by the name of Bartolomeo di Giovanni Corradini was born in the city of Urbino. Little is known of his childhood. At the age of sixteen, he entered an apprenticeship under the guidance of a respected artist from Ferrara, Antonio Alberti. With the encouragement and connections of his master, the twenty year old Corradini moved to Florence in 1445 and, for one year, studied under Fillipo Lippi, one of the finest painters of his age. While Corradini’s apprenticeship in Florence was but one year long, he studied works by Donatello, Brunelleschi and Battista Alberti. It was during the apprenticeship that his fascination with architectural perspective began. In the latter part of 1448, he left Florence and returned to Urbino. Here is some important historical background about Carnevale’s home city. Between the years 1444 and 1482 Urbino was controlled by a powerful condottieri, Federico di Montefeltro. From within the walls of Palazzo Ducale in Urbino, Federico assembled one of the finest libraries in Renaissance Italy. His interest in art and the creation of a center for learning, caused him to issue numerous artistic commissions across Italy. The Dominican order in Urbino was centered in the Church of Santa Maria della Bella. 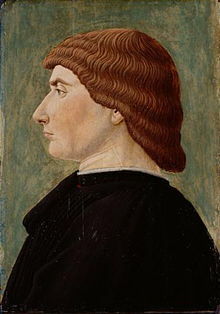 It was amidst the convolutions of power, politics and religion that Federico first encountered Fra Carenvale, who had taken the Dominican vows in 1449. One of Carnevlale’s earliest works, part of an altarpiece for a church in Urbino, is Presentation of the Virgin in the Temple (Circa 1467). This particular work clearly demonstrates Carnevale’s fascination with perspective. The powerful arch and background of his work nearly overpower the figures in the foreground. An interesting side-note about the work is that the shape of the altarpiece is recognizable at the top of the painting. The two figures that surmount the arch were originally the edges of the painting’s frame. 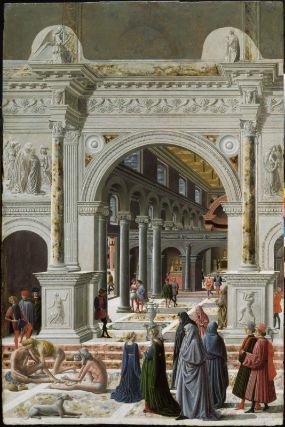 One other work stands out among the many created by Carnevale: The Ideal City (ca 1480 – 1485). This was one of several commissions by Duke Federico di Montefeltro of Urbino for his palace. In a long rectangular frame, the artist has created a sterile, balanced and bleak study of a city. 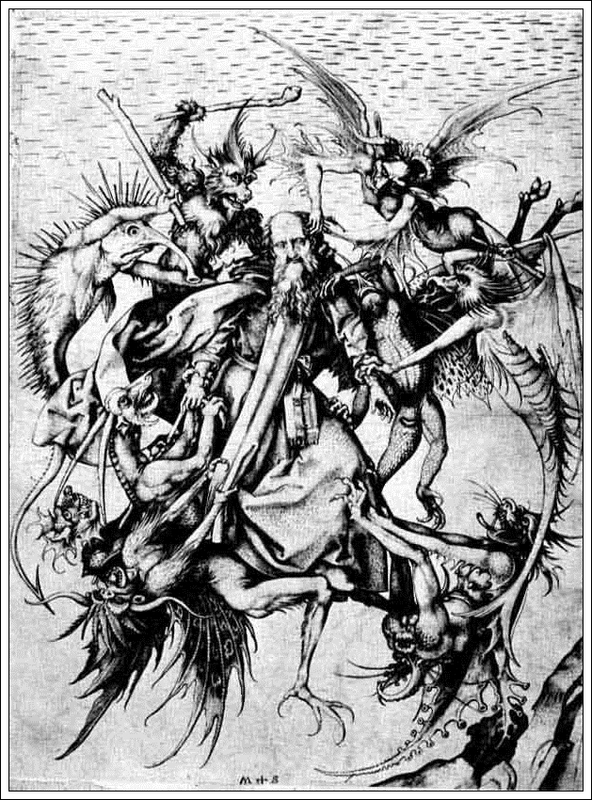 Perspectives are finely focused, the four Cardinal Virtues of Justice, Prudence, Temperance (Restraint) and Courage (Fortitude), top four columns near the center of the work. Why the artist chose to include only twenty-one figures in the work remains a mystery. There is a sterility to the painting. While the scene is balanced in its geometric form, the work exudes no warmth, no emotion. Were the intent to replicate Carnevale’s interpretation of an ideal world, one based on Roman concepts of balance and form, then the artist has well succeeded. This work does show a clear retreat from the emotion demonstrated in his 1467 work of the Virgin and Temple, possibly in reaction to his ascetic and withdrawing life in the Dominican order. The three panels in Carnevale’s only polyptych (altar piece with three or more panels) have been dispersed across Italy. Visitors can view one panel each in the Pinacoteca di Brera and the Pinactoteca Ambrosiana. The third panel is in the province of Le Marche Italy, in Loreto’s Museum of the Holy House. This elusive and little understood artist created numerous works that remain enigmatic gifts to the world of Renaissance art. He is much worthy of more study. She is a beauty, Napoli. From a coastline that wraps beneath Vesuvius toward the long outstretched arm of the Sorrentine peninsula, it is blessed by an ethereal natural splendor. Awaiting those who venture even farther south than Sorrento is the spectacular, rugged coastline of the cerulean sea-washed Amalfi Coast. Such proximate beauty, such struggle, such passion. What a confounding place is this city. I’ve traveled into and around Naples for many years, yet never have quiet made sense of it all. . .until now. Energy hovers over Vesuvius like an invisible veil. In the nearby towns of Vico Equense and Castelmare di Stabia, the ruins of Pompeii to the confining, choking lanes of Naples’s quartieri Spagnoli, that energy ignites the lives of Neapolitans. Such energy can be fierce or frightening, energizing or enervating. Geologists and seismologists are forever anticipating the terrible loss of life and infrastructure when (not if) Vesuvius deigns to yield to her enormous, growing pressures. That veil of invisible power, of a tension that builds beneath our very feet, becomes palpable. On an afternoon visit to the Capella Sansavero in the heart of Naples, I studied Giuseppe Sanmartino’s Cristo Velato, the Veiled Christ. This is baroque sculpture at its finest, highest art. Intricate lines of linen cloth lay across the face of the deposed body of Christ, the veil so intricate and fine that it tempts visitors to pull the fabric away. Don’t, however, be deceived. 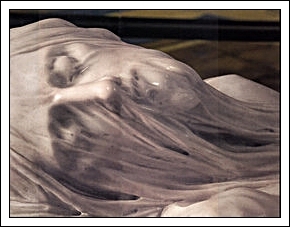 The veil, the entire work, is solid marble: cold, intractable, unyielding. 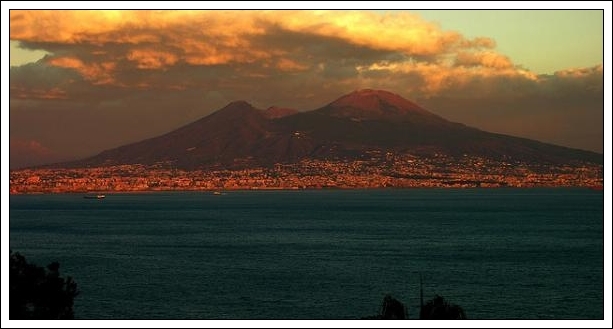 That unseen yet palpable energy from Vesuvius pervades Campanian air. It is as thin and intractable as Sanmartino’s veil. In Naples, life happens in the street; there are few other places to go. In the narrow lanes of this ancient city, people live on top of each other. Secrets are rarely held. To ride the bus in Naples is to ignite every human sense. Everyone, to a person, seems on alert. While many people believe that life in Naples is one of reckless abandon, nothing could be farther from the truth. Everything is an issue; from where to park, to the lackluster and unpredictable schedule of the city’s transportation system, to how to avoid paying any bill, to the intense odors of a Monday morning’s bus ride. This city is – in every possible sense – alive. Lover’s quarrels, negotiations for apartment leases, arguments over bills and marriages all happen in the open, for all to see and hear. Then, there are the churches, by location pattern-less, constructed in many parishes in the most haphazard manner imaginable. They seem scattered by some enormous hand, as if they had been dice tossed during matches of religious zeal to ‘own’ human faith. Naples is a dream; existing between love and hate, blood and life, the sacred and the profane. When visitors consider that unemployment hovers near forty percent, that there is little room to breathe in the quarters of the city and that the Neapolitani exist within a culture of struggle every day to protect their own sanity, an acceptance and understanding settles. There is, indeed, a veil that falls across Naples. It is one of life, of nature’s unpredictable whims, of human furies, of fading religious zeal. Underneath she simmers like Vesuvius, incites vent to human emotion, all the while giving an impression, to the uninitiated, of careless ease. Naples is a city of passion, of life; raw, engaging, frightening and inspiring. Don’t reach for the veil. It’s cold, solid rock. As I made my way along darkened lanes, barely illuminated by streetlamps, I came across one such church, an open door, and the sound of voices. Beckoned to enter by an elderly woman, I shuffled up the worn, roughly carved, steps and entered. From within candle lit stalls rose the voices of passionate belief, of that rare and elusive beauty that is our human voice. A moment’s peace from within as the unending cacophony of life that is Napoli droned in the background. Visit Naples? Absolutely. She is a jewel, a challenge, a confounding conundrum of love, art, passion, of life! I will be presenting, in this blog, details about the treasures of Naples in future posts. The eyes are haunting: oval, staring in pain and grief. It is the fresco that initiated Mannerist painting in Florence: Pontormo’s Deposition in the Capponi Chapel of Santa Felicita. Jacopo Carucci, known as Jacopo da Pontormo or, simply, Pontormo, was born in 1494. A student of the Florentine school, his fresco of the Deposition in the Capponi Chapel of Santa Felicita in the city is considered by many his masterpiece. Brunelleschi, he of the dome and many other architectural splendors for Florence, designed the chapel in which Pontormo worked. Recently, during a late winter afternoon, I visited the church of Santa Felicita. The nave was empty and through a haze of frosted breath, Pontormo’s work sprang more than ever to life. The fragile odor of incense floated in the darkening space as I approached the gate that protects the fresco. It was, this time more than ever, the eyes of the grief-stricken that most startled me. 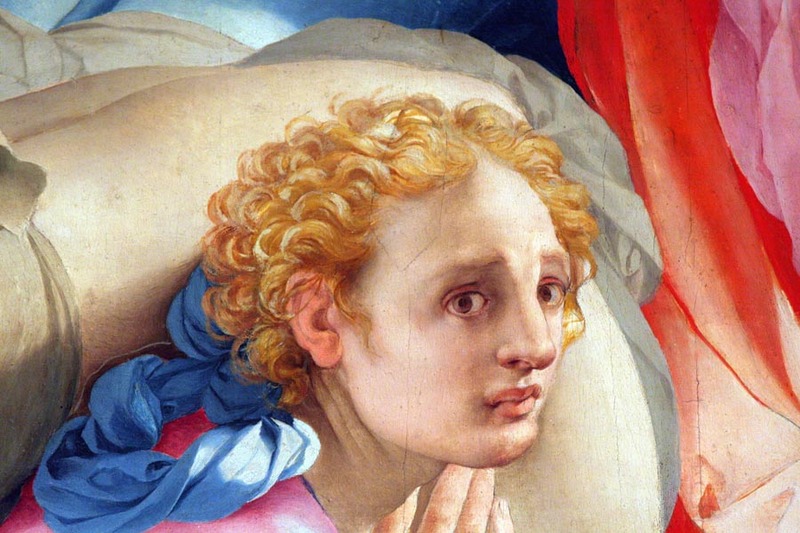 When Pontormo was twenty-one he made the journey to Rome with the specific goal of studying Michelangelo’s work. Buonarotti was completing the ceiling of the Sistine Chapel and the effect that it had on the young Jacopo was life-changing. Pontormo had the opportunity to view the mammoth fresco up close, on the scaffolding. Perhaps he studied the faces and eyes of the Delphic Sybil; her large anxious eyes glance to her left, warily. 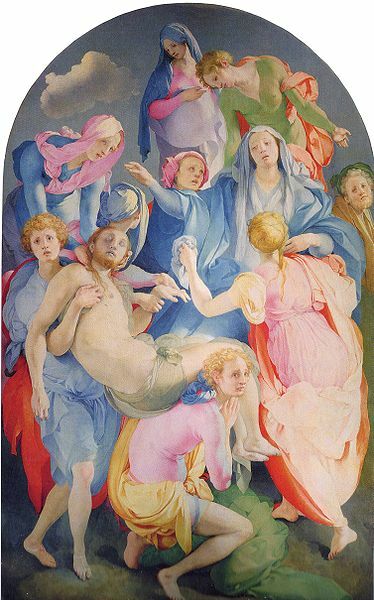 A similar wariness, balanced with fear and grief fill many of the eyes of the figures Pontormo created for his Deposition. The work was finish in 1528 after three years behind a tall brick wall that the artists built to keep the curious eyes and mouths of critics at bay. One of the early artists studies for the Deposition illustrates how the artist used a structure for the fresco without the necessity of reliance on the actual cross. During the Renaissance, the focal point of most other artist’s interpretation of the deposition involved, whether centered or not, the physical form the cross. Pontormo has created a swirling mass of human form, consumed by grief and loss, fear and trepidation. While the cross is nowhere to be seen, while the body of Jesus is supported and held by men and women whose feet seem to barely touch the ground, Pontormo brings us ‘in’ with the eyes. He has created a scene of intense drama, one that does not rely on the standard interpretation of his time and one that clearly broke with the works of the Renaissance. Mannerism was born. As I returned to the Borgo San Jacopo on that winter evening, it was the eyes of Pontormo’s vision that haunted me. If you ever have the opportunity to visit Florence, please don’t miss this masterpiece of Mannerist art, one that brought an entirely new vision and freedom to artists of Italy. 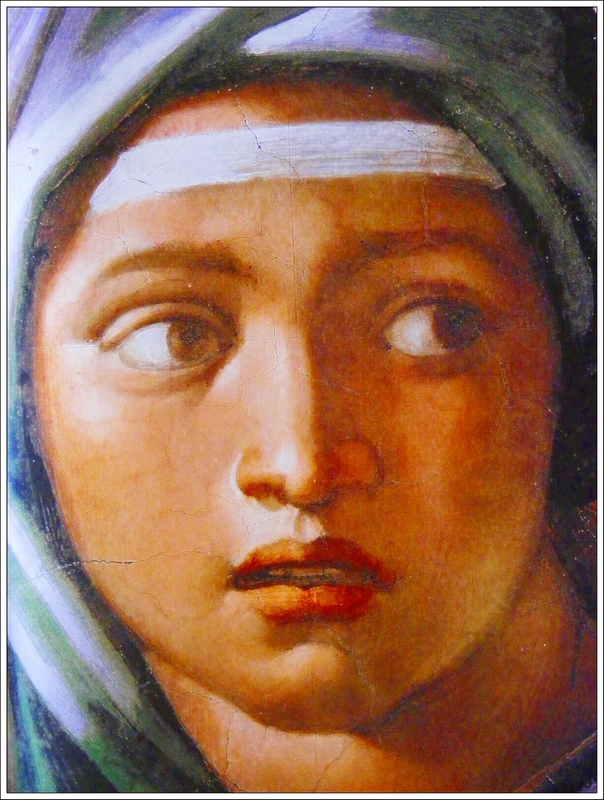 A young Michelangelo, barely twelve years of age, copied an engraving while in the workshops of Domenico Ghirlandaio. I never would have guessed this to be a work by the same master who painted the Doni Tondo, or the frescoes of the Sistine Chapel. Originally attributed to ‘a student of the workshop,’ it was only after the 2008 purchase of the work by a New York art collector, that the panel was definitively studied and attributed to Buonarotti. What a surprising and unusual piece it is. Martin Schongauer, one of four sons of an Augsburg goldsmith, created a varied and complex set of copper engravings. The Torment is one of the few pieces that exist as a separate print. Martin’s more famous works are series: Passion, Death and Coronation of the Virgin, and Wise and Foolish Virgins. 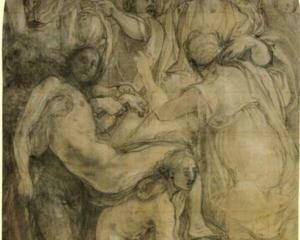 How did this engraving find its way to Florence? The Medici Bank had many offices across Europe. It is possible that the work was sold to collectors in Bruges or Geneva, for example and then it was traded among merchants who traveled to and from Florence on business; all conjecture at this point, to be sure. 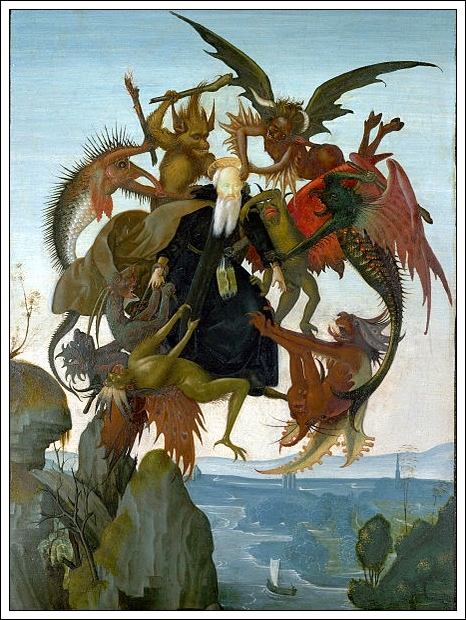 It is certainly difficult to understand why Michelangelo selected, or perhaps was given the commission to paint, his interpretation of this engraving. The young man tightened the design of the original engraving and, it is said by art experts, he studied the anatomy of fish so that a more lifelike rendering of sea creatures could be added to the work. Why would Ghirlandaio’s workshop, in the heart of Renaissance Florence, select such an engraving for their study? Difficult to say. Perhaps it was the unique structure of the work, the elliptical, nearly hypnotic, central core that both draws you in and seems to circulate as you study it. Regardless, the young Michelangelo created a painted wooden panel that moves the tormented saint from the skies above the middle eastern desert to the blue skies of Tuscany. In the background is a river scene that could easily be interpreted as that of the Arno River as it courses through the city. 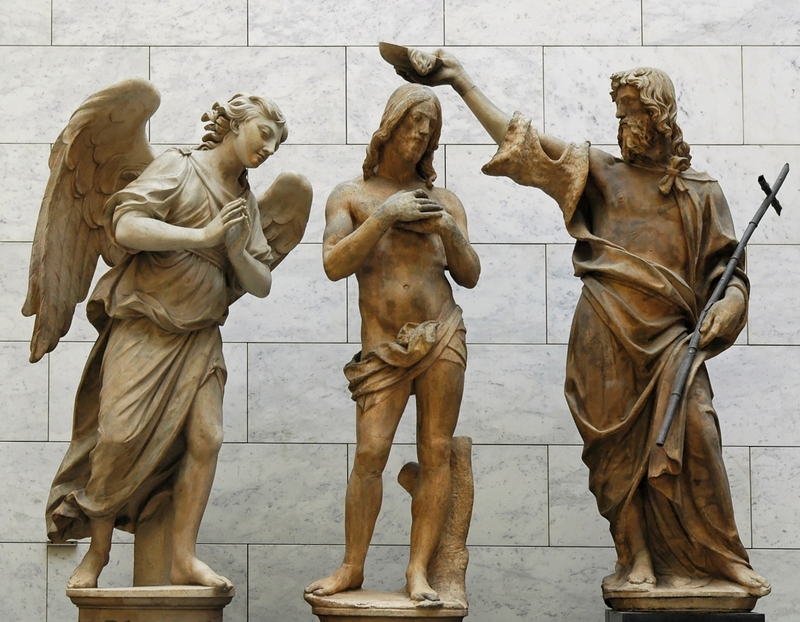 Whether his work was created in the workshops of Florence, in his studio carving masterpieces in marble, or laboring under incredibly difficult conditions on scaffolds in the Sistine Chapel in Rome, the diversity, skill and artistic eye of Michelangelo di Lodovico Buonarroti Simoni continue to fascinate. The Torment is now in the collection of the Kimball Art Museum in Ft. Worth, Texas. As of this writing, I was unable to ascertain the engraving’s location or collection. Marco’s Florence – The Bronzes of the Baptisery – Who were Danti and Rustici? 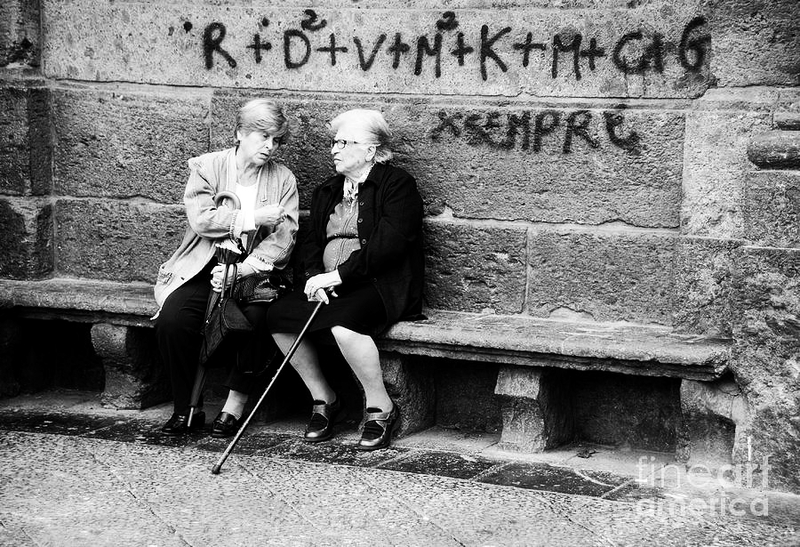 They have faded into the shadows of the Renaissance. Two men whose work surmounts doors of the Baptistery in Florence, you might imagine, would be of the fame and stature of other Renaissance sculptors or artists in bronze, like Donatello or Cellini. While we may not, today, recognize their names, the incredible quality of their works stand as testament to phenomenal talent. We hardly ever notice them, the giants above the doors of the baptistery of San Giovanni Batista in Florence – St. John the Baptist Baptistery. Ghiberti’s Eastern “Doors of Paradise”, so termed by Michelangelo, draw the crowds that hover around what are actually copies made from decades old casts. While crowds admire and photograph the eastern doors, walk around to the north and south doors and look up. On the south side of the octagonal structure are doors designed by Andrea Pisano. The casting and gilding were done by Leonardo d’Avanzano, a Venetian famous for his renowned techniques with bronze. These doors were originally the eastern doors until Ghiberti won the competition for a new set of panels. It was in 1452 that the Pisano doors were moved to their present location on the building’s south side. 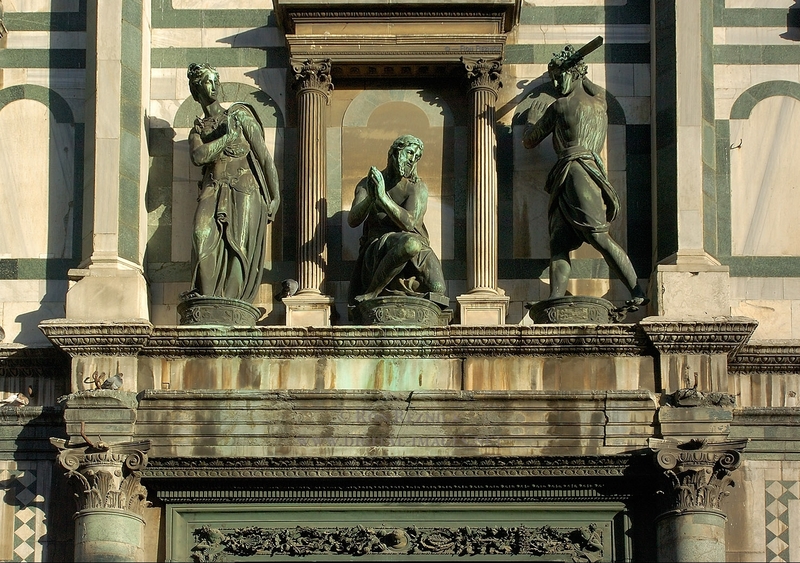 Above the south doors are three statues depicting the Beheading of John the Baptist by Vincenzo Danti. He was born and raised in a family with a goldsmith father and was educated in the art of sculpture in Rome. 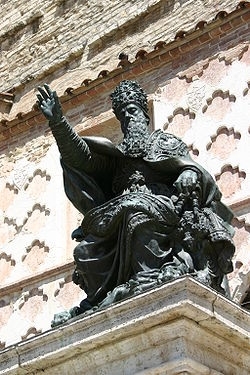 He received a commission in 1533 for a bronze of Pope Julius III which stands outside of the cathedral in Perugia. A commission followed in 1567 for three figures to stand above the south doors of the Baptistery. These are considered to be his masterpieces. An interesting additional detail about the figures that surmount the “Gates of Paradise” at the Baptistery. These three figures, depicting the Baptism of Christ, were started by Andrea Sansovino between 1501 and 1503. What many people do not know is that Sansovino was unable to complete the commission. Two of the figures, Christ and the Baptist, were completed by none other than Vincenzo Danti. The third figure, an angel, was not completed until 1752 by Innocenzo Spinazzi. On the north side of the baptistery are another three figures, titled The Sermon of the Baptist. Created by Giovanni Francesco Rustici-and, many believe, in concert with Leonardo di Medici with whom the sculptor lived after meeting the maestro in Verrocchio’s workshops-the pieces were never sufficiently paid for nor credit given, according to records of the time. Yet, these incredible bronzes stand strongly in company of Sansovino and, even, Michelangelo. Vasari in his Lives of the Artists, claimed that Rustici was one of the greatest Renaissance sculptors in Tuscany. When you visit the city, and stand before Ghiberti’s unforgettable eastern doors of the Baptistery, please take time to study the figures above all of the doors. Little known though they may have been, the bronzes are all fascinating works of art, works that introduce us to Vincenzo Danti and Giovanni Francesco Rustici. The Baptistery is directly in front of the Duomo in Florence. Art historians have stated that twenty-five percent of the entire world’s art treasures reside in Italy. While it may be something of an exaggeration, it is true beyond doubt that the artists, architects, sculptors, writers and musicians of Renaissance Florence gave to the world a gift of beauty whose value is unimaginable. It has been a great pleasure, over the years, to teach a class on the Art and History of Renaissance Florence. As part of establishing a sense of the time in which the artists created their works, I share a series of photos of period work along with music that would have been heard by contemporary Tuscans. In Introduction through 1425 A.D., the first class, Gregorian chant serves as background to the works of artists Fra Angelico, Taddeo Gaddi, Giotto, Cimabue and others. For those who are interested in the Art and History of Renaissance Florence, even if only a passing curiosity, I hope that you enjoy viewing this video, and the others that will follow in weekly future posts.